I hate tangled guylines. When it’s time to pack my tarp, I take special care to wrap each guyline so it is ready to deploy. One advantage of coiling up guyline is that it helps avoid tangles in the line and unintentional knotting. In some wind storms, I’ve had my guyline tie itself into knots thanks to the constant whipping and curling as it is blown around. In these conditions, I wrap the extra guyline when the tarp is pitched. I basically use two wrapping techniques for my guyline: the figure-8 and the hand wrap. Both work well, but the figure-8 wrap is nearly 100% effective in eliminating tangles, no matter what line you choose. These wrapping techniques are also handy with full-length ridge lines. A popular line used for ridge lines (and even some guylines) is 1.75mm Zing-It. This Dyneema line is very strong for its size, but prone to knotting and it tangles easily. The figure-8 wrap is very effective in making this line just open up when it’s time to deploy. The other line I often use is braided mason line. I like this line because it is inexpensive, easy to knot, lightweight, and packs down small. I also like the visible neon colors. I most often use a palm wrap for this line and it works great. Some tarps, notably the Hennessy Hammock models, have pockets on the corners near the guy points. These pockets are a handy place to store your guyline, but I still recommend wrapping your line first otherwise you wind up with a rat’s nest that becomes a nightmare to untangle. Figure 8 is the best ever! Never had a knot form in my tarp guylines since I started using it. Thanks for sharing the tip. Thanks Brian! 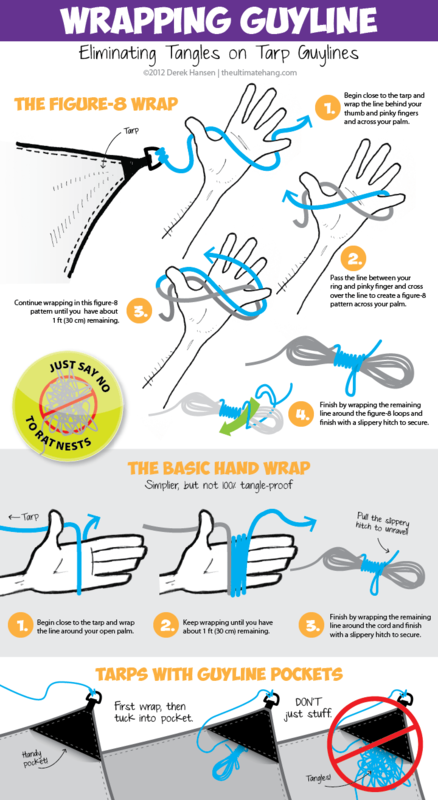 I agree — the figure-8 wrap is great, and it’s easy too! It really doesn’t take that much time and the benefits outweigh the small time it takes. The visuals are priceless. Excellent tip, thanks! Rather than doing a slippery hitch, when I reach the last few inches of the string I simply push it through the loop that I’m winding towards. Leaving a couple of inches hanging through the loop is enough to keep it from coming undone. I wrap my guylines around their individual stakes. All I have to do is connect it to the tarp and stick it in the ground. Works great for me. In general for generic bundling of lines I find that when wrapping the finishing wrap around the bundle that it works better if the wrap over the line instead of going forward (as pictured). I find that wrapping over the line itself prevents the finishing wrap to lose its tension/grip on the “free” end (the end that doesn’t have the slippery hitch). The only difference is that I start the wrap at the end of the straight-line right before going around the bend/bend instead of beginning the wrap after going around the bend(thumb, pinky, side-of-the-hand) or beginning of the straight-away. However, if I’m bundling my tarp guylines to go into a pocket and the tarp goes into its snakeskins I don’t even bother with the slipper hitch, just figure-8 and final wrap of just a couple of turns will do. The pocket keeps everything tight. I start wrapping as pictured, on the secured end. When I get to camp I often times don’t even unravel the entire guyline, merely pulling it from the standing end just as much as I need I can easily form a lark’s head on the stake,. The bonus is that the extra line is already bundled next to the stake. Got the book. Love the site. Refer to it often. Cheers. I know this post is 6 years old but the links to the zing-it and braided mason line are broken. Can you recommend a current supplier for either or both?